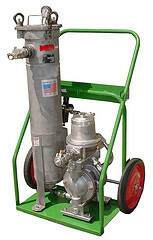 Success Story: Vacuum Dehydrator Rescues a Paper Machine! 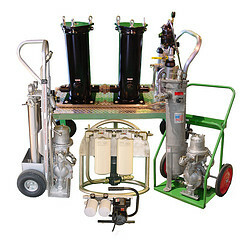 If you didn’t know already, one of our specialties is filtration equipment rentals. 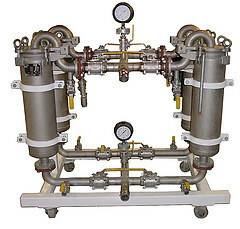 Recently, we rented a vacuum dehydration system to a paper mill. The mill was seeing extremely high levels of moisture in the hydraulic oil of one of their paper machine’s reservoirs, which had a capacity of approximately 1,000 gallons. The oil, dirty and contaminated with water, appeared to be a milky color. It definitely needed to be filtered! But not all oil purifiers are the same. In order to help them, I suggested they use a VDOPS (Vacuum Dehydrator Oil Purification System) rated at 20 gallons per minute (GPM). After renting the unit from us, they installed it near the reservoir shortly before a holiday weekend. Upon starting, the dehydrator was set at 18 inHg of vacuum and a heat setting of 150 *F. When the maintenance crew returned after the holiday, the dehydrator was found to have been shut off sometime during the weekend by shift workers. The crew also found the reservoir level had already dropped by 2 barrels! The maintenance crew then restarted the dehydrator with the initial settings (18 inHg vacuum, 150 *F) and left it to run for the next 5 days. During inspection on the 5th day, the crew noted that the reservoir level had dropped by 14 whole barrels. There really was an enormous amount of water mixed in with that oil! They then inspected the remaining 9 barrels of oil left in the machine’s reservoir, and they determined that the oil actually looked better than new! At that point, the crew added new oil to the reservoir and set the dehydrator to run at the same settings, with a return flow rate of 10 GPM. This fully resolved their problem, and the paper machine is operating smoother than ever. Are you interested in learning more about maintaining your oil quality? 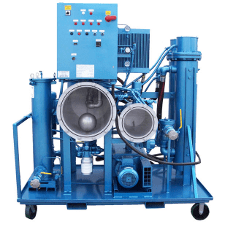 We offer vacuum dehydrators that come equipped with variable frequency drives (VFDs) for the discharge pump, which give much greater flexibility of operation. Click here to check out the various types of dehydrators that we have available. 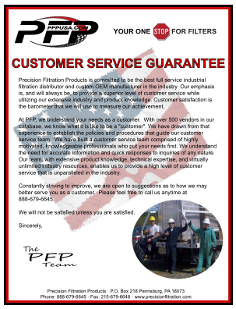 We’ll be sure to help you improve your oil quality, and we’ll save you time and money in the process.